St Martin’s Healing on the Streets team is well established on Edgbaston St. Passers-by have now started approaching us to pray for them instead the other way around. 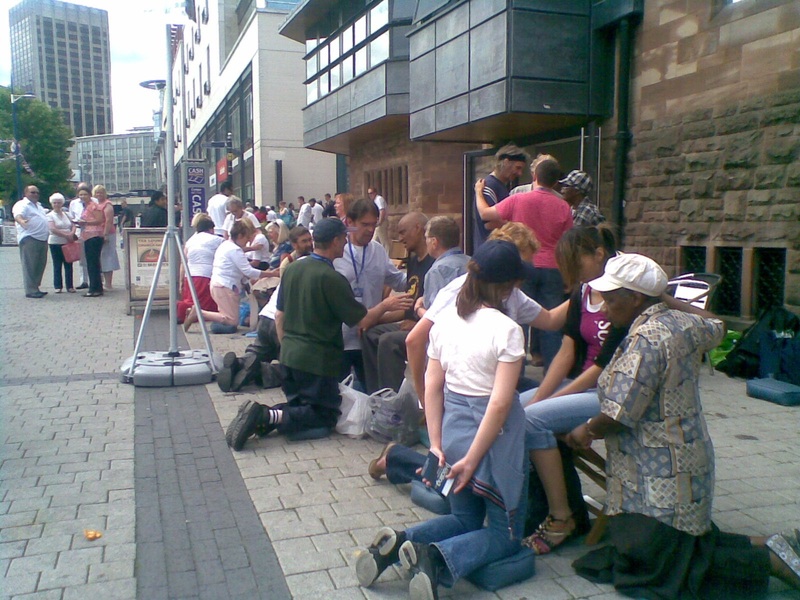 We still give out leaflets inviting them to sit on chairs and receive prayers. This last session even before we finished setting up the banner, chairs and so on, some folks were there waiting for us to pray for them. The queue started forming from then on with just a few periods of quietness. At the end of the session it happened again. We had already packed up most of our stuff when someone came rushing to us and said, ‘Oh. You’ve finished already. I came here to ask you to pray for me.’ Of course we prayed for him – standing up and all. Another lady came by and said to one of the members when she was offered prayer, ‘You have already prayed for me and I am healed’. All of this is good encouragement but above it is all for the great glory of God. A man who had previously had prayer for his knee, came back to say his knee was much better. A Christian man with broken relationship with his dad was able to forgive him as the team prayed. He also wanted his relationship with God to be restored. Another Christian man who has been prayed for before, wanted further prayers as he felt trapped by circumstances in his life. Spirit so he could support and help his friend. ‘He will deliver the needy who cry out, the afflicted who have no one to help. He will take pity on the weak and the needy. He will rescue them from oppression and violence.